Last year was the first time in a long while that I had not taken an extended period of time off work in the summer so we had to become a little more creative in our childcare. With the chaos of our renovation, it was even harder to plan to get away. However, one thing we already had planned before we even started with the renovation was a trip to Alberta in July. I couldn’t have been more pleased with how this worked out – the kids were champs flying and got to have plenty of good quality time with their little cousins and even some gorgeous Alberta summer weather, which is not always guaranteed. The kids spent their time riding the tractor with Grandpa U., baking with GramA, going for cannolis at Sweet Capone’s, playing in the wading pool at the Legislature Buildings in Edmonton, and of course plenty of time with the family dog. 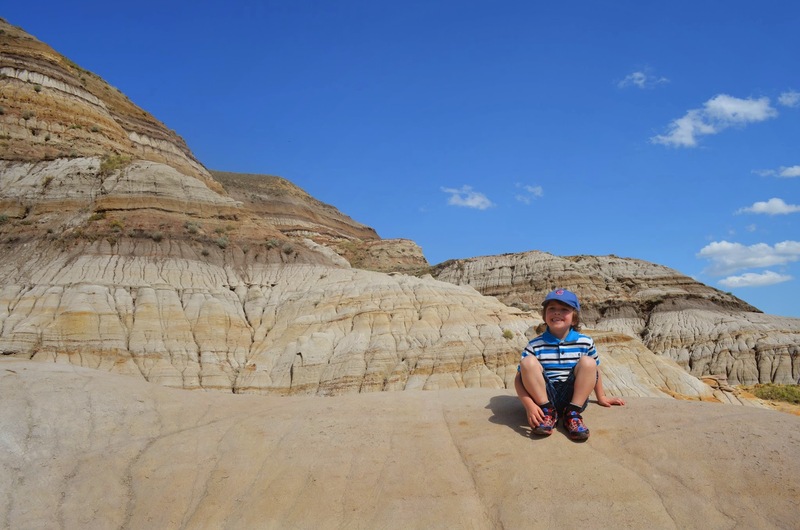 After ten days in Alberta, we may not have been quite ready to hit the road again but it was time to get going and our first day took us through Drumheller, one of the kids’ favourite spots in Alberta. There is nothing quite like this area of Alberta that I have seen anywhere else in the country. The hoodoos and landscape are amazing but it did provide an auspicious start to our drive home. Although we didn’t do the Royal Tyrell Museum this time I would recommend it to anyone who is visiting Calgary or able to make the drive out. We did however make time to visit ‘The World’s Largest Dinosaur’ and walked up the admittedly wobbly steps to the top to take in the view from his mouth. We also stopped at the hoodoos east of Drumheller which are really one of the coolest things to see in Canada. It is hard to imagine sometimes that this landscape is less than a three hour drive from the mountains we had stayed in the week before that are so lush. Out first night on the road, we stayed in Dinosaur Provincial Park. This is a place I had wanted to stay for quite some time – it has the highest concentration of fossils anywhere in the world – and the valley is fascinating. However, I think it is safe to say that despite the uniqueness of the area, this night of camping was a bit of a disaster. When we arrived, it was scorching, about thirty degrees with no escape from the sun because of minimal tree cover in the campground. The sites in the campground are really close together, especially compared to some of the other excellent sites we had in other areas. We ended up boxed in, with an arguing couple on one side who ran their air conditioner all night. The second thing was the bugs – we had experienced basically no bugs the whole trip but this place made up for it. They were INSANE – the size of small sparrows and everywhere. After doing the self-guided fossil tour which got us out into the valley to explore, we hunkered down in the tent to avoid these mosquitoes. Typically, this area of the country is pretty dry – the landscape is essentially a desert with farmers relying on irrigation for crops. However, at some point in the night it started to rain, and this rain turned into a crazy thunderstorm although there had been no indications that one would start. It sounded like it was right on top of us and we escaped to the car. At that point, we realized that being in the river valley, all of this rain was coming down towards us and the dry creekbed behind us that had been about eight feet deep when we arrived now filling up rapidly. I am no expert on flash floods but I guess this is how they happen! We drove from our campsite to the washrooms to try and escape the downpour, only to find a river flowing in front of the entrance that prevented us from entering. We were not the only people to abandon our campsite because although it was four in the morning, about a half-dozen of us were sitting in our cars in the main lot. It is hard to describe how much water was coming down but a river had essentially taken over the parking lot and I remember having the thought at a certain point that the road out of the valley was going to get washed out and we’d be stuck. The scene was so chaotic that I would have loved to grab some pictures but it was so dark except for the lightning strikes that there was no way to do so. Eventually, after about an hour in the car, the rain started to ease and we ventured back to our campsite. The creek had now overrun its banks and it became clear that our campsite was in much better shape than some of the others that were drowning in water. We had the thought to try and grab another hour of sleep but as soon as we got in the tent, another couple of sharp cracks of thunder hit and we abandoned that idea. After throwing all the wet gear in the roofbox, we were out of the campground before sunrise and desperately seeking coffee. That marked the end of our Dinosaur Provincial Park experience. In summary, what a beautiful and unique area of the country but I am pretty sure we will not seek this place out again after that experience. Regardless, even with the craziness and overall miserable nature of the night, I am sure it is also one that our family won’t forget that we spent together – and that’s one of the things that makes family vacations so great. When growing up in Alberta, it was easy to take the Rocky Mountains for granted. They are always there, they aren’t going anywhere, and as a kid it was easy to downplay their sheer magnitude and beauty as we would drive through a couple of times a year on our way to Victoria or another destination. Moving out East, unless people have been, there is a general sense that the Rockies must be pretty impressive but that they can’t be too much different than the ‘mountains’ out here. I was reminded this summer of how false that is and how truly amazing the Rocky Mountains are. As part of our prolonged driving trip, we tacked on three days to do a loop through Banff and up highway 93 toward Jasper. For sheer scenery, I would put this up against anywhere. The fact we had beautiful weather to enjoy it made it even better. Banff, and the Rockies, is all about being outdoors so camping is the ideal way to visit. It is also much, much cheaper than the overpriced accommodation that abounds in the summer. We were very fortunate to score a beautiful site in the Two Jack Lakeside campground that is run by Parks Canada. This is a relatively small campsite that is located about 10 minutes outside of Banff. Booking for these sites starts in January for the whole summer and we were lucky to find a cancellation that allowed us to stay. For reference, we stayed on site #8 and if you do have the luxury of being picky, I would suggest staying on that side of the campground as sites have a bit more privacy and are located a little further apart. As we checked in to our site, we were provide of warnings of both bears and wolves in the area. Although a bear warning is pretty standard in the Rockies, I think this is the first time I have stayed in a campsite that was having a problem with wolves. Although we had no issues, the campground was subsequently shut down to tent campers about a week after we left because of persistent problems with one wolf. We enjoyed our location on our first afternoon, hiking around Two Jack Lake and relaxing at our fire while a bunch of deer filled in behind our site. The next morning, we headed into Banff and although it is a pretty touristy, there were still many things we wanted to show the kids that I had experienced as a kid myself. We did a loop around the golf course before visiting the famous Banff Springs Hotel and having a picnic lunch on the grounds there. In the afternoon, we visited the Cave and Basin Historic Site and wandered some of the shops of the main street before heading up to the Banff Upper Hot Springs to relax in the warming, mineral-rich waters. For dinner, we visited a Banff institution, the Grizzly House Fondue Restaurant. This place has not changed since I visited as a child, and probably since many years before that but it was great and lots of fun. On our third day, we had to pack up our gear and head for home, or my parent’s place at least, but we chose to do so via Highway 93 which runs north towards Jasper. This highway is amazing with beautiful views everywhere you look. After a great roadside picnic lunch, we were greeted by a black bear in the ditch – who was in turn greeted by crazy tourists that were trying to take a selfie with it. Although that aspect does seem a bit like a theme park, there is still something really cool about spotting a bear in their natural habitat. Our quick trip to Banff and the Rockies reminded me of how much I miss it, and will certainly ensure that we concentrate on making the effort to get there more often. After returning from our epic four-province, five-state, 8800km roadtrip I’ve struggled with how to break this up into manageable posts but I will do my best and start with our journey out to Edmonton, Alberta. Heading out in the pouring rain, we made it to just east of Sault Ste. Marie on our first day. Before our first campground we stopped at a great Canadian icon, the giant nickel of Sudbury. Somehow, this is still as impressive as it was when I was a kid and it was fun to revisit it with my own kids who were equally as impressed. We spent our first night at Chutes Provincial Park and once set up had a fun evening doing their scavenger hunt, eating dinner at our site and making marshmallows over our campfire. Despite the bear warnings, we managed to avoid those. Heading north through Ontario, we knew we had to be a bit more strategic about where we stopped since campgrounds are few and far between. The weather seemed more unsettled further north so we decided to make it a short day and stay about an hour north of Sault Ste. Marie at the beautiful Pancake Bay for our second night. Before we did though, we took our time in the Soo, checking out the locks and the highly recommended Pino’s grocery. At our beautiful site on Pancake Bay, Ella and I hit the lake for a swim. After that experience, all cold water will now be compared to the glacial waters of Lake Superior. Our third night was spent in Thunder Bay after driving over the top of Lake Superior and the next morning we didn’t drive far before checking out the impressive Kakabeka Falls. After all that time on the road, we took a break in Winnipeg, settling down at the Fort Garry hotel for a couple of nights. The hotel, in the style of old CP hotels was a pleasant break from the road and we really enjoyed our time in the city. Highlights included hitting the Bridge Drive-In on the way into town, touring the Legislature Building, visiting the Canadian Human Rights Museum and eating dinner at the new Forks Market. From Winnipeg, we continued west to my birthplace, Saskatoon. This city is such a beautiful one in the summer with the river valley and the sunset that doesn’t start until 10:30. Even though we didn’t roll into the Gordie Howe Campground (a classic that I last stayed in 20 years ago) until about dinner time we had plenty of time to tour the University, eat a delicious dinner at Primal and enjoy the beautiful views over the river valley. Finally, from Saskatoon we made the final push to Edmonton, a quick five-hour jaunt over the beautiful prairie. Despite the length of this overall journey, our impression was that it didn’t feel overly long – our longest day was from Winnipeg to Saskatoon which took a little over 9 hours and this was slowed down by construction outside of Winnipeg. Most other days we were able to limit our driving to about 7 hours at the most and this made for a pretty comfortable pace. On Saturday, we will leave for our most ambitious roadtrip yet. Last year we tackled Eastern Canada, which you can check out here, but this year we will head west and the 4000km we travelled last year looks pretty easy compared to this year’s task. Through to Alberta we pretty much have our route set; although the Google Map above doesn’t reflect it, we will actually head through Sault Ste. Marie and follow Lake Superior up to Thunder Bay before passing through Winnipeg, Saskatoon and to Edmonton. On the way back, we are a little undecided as to what route we will take and whether we want to include a large city such as Chicago – this may need to be something we decide as we go. Although I have done the drive many years ago, I am excited to show the kids the great diversity of landscapes in Canada and I hope we will be able to do that by travelling through the Canadian Shield, the Prairies, the Rockies and the Badlands. I also expect they will gain a new appreciation of the enormity of our great country. The four-hour flight to Edmonton doesn’t translate in the same way. If anyone has suggestions for ‘must-see’ spots, or ‘must-eat’ restaurants, we’d certainly appreciate your ideas and hopefully we can add to them when we return. If you’d like, follow along with our adventure on Instagram with @uhrblock or on the sidebar of this site. The big guy’s actual highlight would be eating the gingerbread house, not making it. Bowling. Nothing has changed at the Ambassador Lanes in twenty years since I was last there. One of our other day trips back in Alberta was to the world-famous Tyrrell Museum and the town of Drumheller. This was a great age to take the kids, they really seemed to enjoy the dinosaurs. The big guy was a little afraid that there wouldn’t be enough with ‘eyes and skin’ but he was happy with the mix of those with ‘just the bones’. A cool daytrip – the area is definitely a unique Alberta attraction.